MONMOUTH JUNCTION — For the South Brunswick High School football team, its senior class did something no other class in history has done: defeat rival North Brunswick in four straight Thanksgiving Day matchups. Behind the running of Dontae Strickland and a stellar performance from its defense, South Brunswick prevailed 34-13 Thursday morning to retain the Mike Elko Trophy. Strickland, a junior, rushed 12 times for 179 yards and a pair of first-quarter touchdowns, to lead an onslaught of 401 rushing yards and 427 total yards. Quarterback Amir Johnson, another talented junior, carried 12 times for 119 yards and two touchdowns, as South Brunswick (7-4) built a 27-0 first-half lead. But for the senior class, led by bruising fullback Dahrae Ford, who was unable to play Thursday due to an ankle injury, became the first class to go 4-0 against North Brunswick (1-9). North Brunswick still leads the all-time series 23-15-1, but South Brunswick has has the edge over the last decade, winning six out of 10. Since a tie in 1993, the Vikings have won 13 of 20 over North Brunswick, who made the 10-mile trip down Route 130 for the 39th time. Raiders quarterback Rafleu Alharazim led two impressive touchdown drives sandwiched around halftime, rushing for a 6-yard score at the end of the second quarter and tossing a 21-yard touchdown to Joseph Manley early in the third stanza. Alharazim totaled 103 yards through the air and on the ground, but did throw two costly interceptions to halt North Brunswick drives. Once South Brunswick built its 27-0 lead, Johnson and Strickland helped bury the Raiders with inside runs out of the triple-option offense that Goerge brought with him before last season. Matt Golden, filling in for Ford at fullback, rushed 10 times for 59 yards, getting accustomed to a role he’ll presumably fill for the Vikings next season when they play their first game on turf. Goerge said the school plans on installing field turf at Viking Stadium before the 2014 season, which will only help speedsters like Strickland and Johnson. RUSHING: NB – Alharazim 10-22, Bryant 4-14, Nance 7-4; SB – Strickland 12-179, Johnson 12-119, Golden 10-59, Botett 6-20, Fehte 1-11, Lee 1-5, Allen 2-4, Morse 1-4. PASSING: NB – Alharazim 8-13-2-81; SB – Johnson 3-4-26. RECEIVING: NB – Manley 3-36, May 2-24, Castellanos 1-15, Bryant 1-6, ; SB – Golden 2-25, Cerminaro 1-1. MONMOUTH JCT. — After missing a month following an emergency appendectomy, Hunterdon Central High School running back Jason Cabinda has certainly made up for lost time. In the Red Devils’ opening round win over Old Bridge last week, the Penn State-bound Cabinda racked up 168 yards and scored two touchdowns. 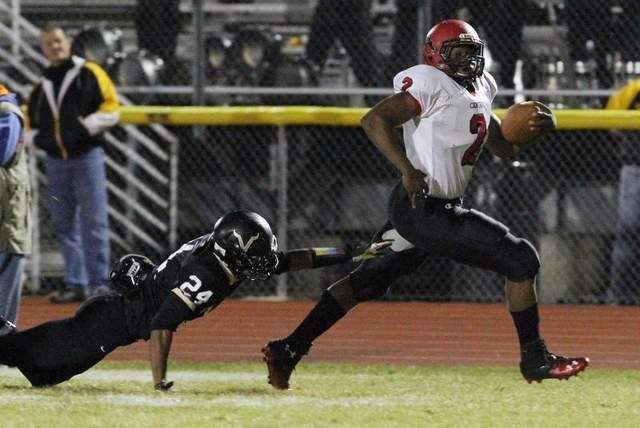 Friday night against fifth-seeded South Brunswick in the Central Group V semifinals, Cabinda rushed for 212 yards and three scores, leading the sixth-seeded Red Devils to a 42-7 victory and a berth in the Central Group V championship game. Hunterdon Central will take on top-seeded Manalapan, a 34-7 winner over Sayreville, for the title. Cabinda and quarterback Mike Knight, who also missed a month after suffering a foot injury, both returned against Old Bridge in the first round, and against South Brunswick, the dynamic duo was clicking on all cylinders. Knight was 10 of 17 for 129 yards and two touchdowns, hitting seven different receivers in the process. Cabinda added four catches for 63 yards, giving him 275 yards from scrimmage on the night. Hunterdon Central (7-4) jumped out on top 14-0 before South Brunswick could even blink, as Cabinda capped the opening drive of the game with a 39-yard run and Knight’s pass to Daniel Scassera for 15 yards made it a two-score game early in the first quarter. From there, Cabinda punished the Vikings defensive front-seven, bowling over multiple defenders on nearly every run. South Brunswick (6-4) never got its offense rolling, as bruising fullback Dahrae Ford couldn’t get his legs churning per usual. He finished with just 11 carries for 43 yards on the night. The Vikings’ only offensive burst came from tailback Dontae Strickland, who went 53 yards for a touchdown in the second quarter to cut the lead to 28-7, but South Brunswick never got closer. Strickland finished with 97 all-purpose yards on nine touches. After missing such valuable time this season, Cabinda said that he never lost faith in his squad’s ability to make a deep run into the postseason. When asked if he thought a month ago, sitting on the sideline injured, if his Red Devil teammates could get this far, his answer was clear. RUSHING: HC – Cabinda 23-212, Powell 2-6, McGee 5, Knight 2-minus 9; SB – Strickland 9-83, Ford 11-43, Johnson 11-29, Botett 5-24. PASSING: HC – Knight 10-17-129; SB – Johnson 6-12-1-40. RECEIVING: HC – Cabinda 4-63, Scassera 2-26, Wynkoop 1-18, Dunleavy 1-17, Miller 1-16, Kendzulak 1-12; SB – Dunleavy 3-21, Strickland 2-14, Jackson 1-5. EWING — After playing three heart-pounding games in the Non-Public South A Tournament, the Bishop Ahr High School girls soccer team put together one of its finest performances of the season Wednesday night. Jillian Vassallo’s 47th minute goal was the contest’s lone marker and Bishop Ahr (17-2-2) captured its first state title in school history, 1-0 over Immaculate Heart Academy in the NJSIAA Non-Public A Final at The College of New Jersey. The Trojans had never even appeared in a state final prior to this one, but the stage was certainly not too big for them on a chilly evening. Vassallo, who’s been Bishop Ahr’s top scorer all season long, turned away from an IHA defender just outside of the 18-yard box and ripped a low line drive past Taylor Lupi. It was just the third goal that mighty Immaculate Heart (19-2-1) had yielded all year. Senior goalkeeper Brianna Foster, who’s been a rock in the net for Bishop Ahr in 2013, shrugged off a nasty collision in the first half and played hobbled for the remainder of the contest. She made five saves to pitch her 16th shutout of the season. IHA ramped up the pressure in the second half after Vassallo’s goal, but every time it looked like the Blue Eagles were going to come up with an equalizer, Foster was there to keep it out. The back line of defense of Cali Clarke, Claire Dundon, Sarah Harmon and Alexa Vassiliadis thwarted every real shot that Immaculate Heart had. The Trojans certainly fed off the energy from the hundreds of fans that made the trip from Edison to Ewing, paying their own way for buses and game tickets, as the classmates were loud and engaged throughout the contest, chanting and screaming until the final whistle. Foster and the stingy back line of defense yielded just five goals all season long, with a shutout streak of more than 900 minutes during the regular season. BERNARDSVILLE — Before she jogged up from midfield to take what could have been the game-winning penalty kick for the Bernards High School girls soccer team, Maddy Auerbacher didn’t know if she could make the shot. “I was really scared that I wasn’t going to make it and I knew that Ramsey is really good at penalty kicks. But I got a rush running up to it and I looked at the side I was going to shoot at, hit it, and made it,” Auerbacher said. Her goal, along with three others in the shootout, gave Bernards the victory 2-2 (4-2 in shootout) over Ramsey Tuesday night in the NJSIAA Group II semifinals at Ridge High School. The Mountaineers will play Rumson-Fair Haven in Saturday’s Group II final at The College of New Jersey. Kickoff is scheduled for 5:30 p.m.
After making her penalty kick, the entire Bernards team and a host of students and fans spilled onto the field and mobbed Auerbacher as the Mountaineers celebrated their first trip to a Group final. Montana Sutton, Lucy Grey and Emily Maheras each scored on their penalty kick attempts for Bernards (20-3-1), and goalkeeper Nicole Sullivan didn’t even have to make a save in the shootout to ensure victory. Ramsey’s second and third shooters missed the net, the second of which hit the football crossbar just above the soccer crossbar. The game went to overtime after Ramsey was the beneficiary of a questionable call late in regulation. In the 68th minute, a Rams player was pushed to the ground just outside of the 18-yard box and the referee called a foul, and with the foul came a free kick, which Ramsey’s Gabrielle Martone stepped up and lofted over Sullivan’s outstretched hands to tie the score at 2-2. Bernards had taken leads of 1-0 and 2-1 in the game, the first of which came in the 15th minute of play. Laura Galli worked her way through the Ramsey defense and into the box before sending a low shot past Rams goalkeeper Molly Barrow. The game remained 1-0 for only nine minutes, as Ramsey got even with some skill of their own. Kelly Redl split two Bernards defenders and shrugged off a tackle just inside of the box before ripping a shot past Sullivan. But the Mountaineers kept working hard and in the 30th minute, they regained the lead. Bernards maneuvered the ball deep into Ramsey territory, and Barrow saved Kristin Coury’s initial shot, but the ball bounced right to Emily Maheras on the doorstep, and the sophomore didn’t miss the opportunity. EWING — The third time was a charm for The Gill St. Bernard’s School boys soccer team. 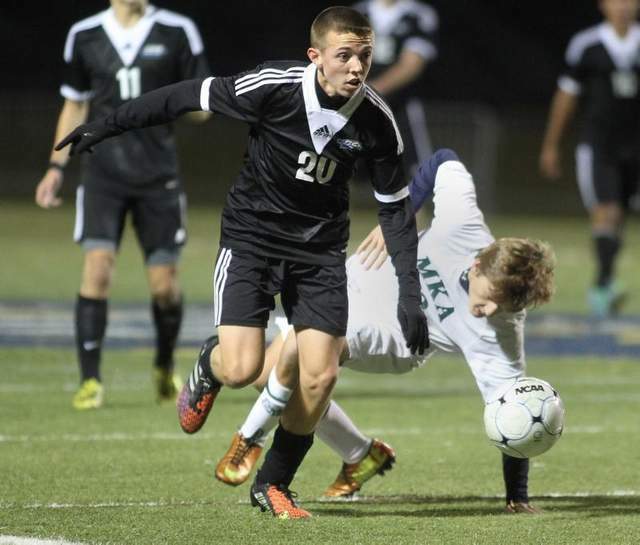 Behind second-half goals from Justin Durcan and James Reiner, the Knights finally got past Montclair Kimberley in the NJSIAA Non-Public B Final, 2-0, Monday evening at Lions Stadium on the campus of The College of New Jersey. The two teams had met in this matchup in each of the last two seasons, with Montclair Kimberley winning both times, but the Gill St. Bernard’s two stars ensured it wouldn’t happen again. Durcan’s goal in the 45th minute proved to be the game-winner once he ran through the Montclair Kimberley defense and finished on his right foot from inside the box. The tally was his 21st of the season, but Reiner one-upped his classmate. With 7:50 remaining, Durcan played a free kick into the box, where Reiner worked it to his feet. The senior turned and ripped a shot past MKA goalkeeper David Kauffman to double the lead and put it out of reach. It was his 23rd goal of the season and ended any chance the Cougars had at making it three straight state titles. On Nov. 3, the Knights topped Montclair Kimberley 4-1 for the Prep B title, as Durcan registered a hat trick. His goal didn’t put Gill St. Bernard’s at ease on Monday night, according to Bednarsky, but Reiner’s did. Montclair Kimberley turned up the pressure in the second half, using their stars Malcolm Dixon and Wesley Wade, both of whom are committed to play at the University of Virginia in two years, but goalkeeper Jordan Schreer had all the answers. The junior made seven saves to pitch the shutout, which was impressive to his coach. “Jordan played great. He was more than stellar in goal for us tonight,” Bednarsky said. Gill St. Bernard’s has now won two NJSIAA state titles in school history, with the first coming in 2009, when the Knights beat St. Rose. MONTGOMERY — A year after winning the all-around title as a freshman, Bishop Ahr High School gymnast Julianna Drapkin came up just 0.050 short of repeating at the NJSIAA Individual Championships Saturday afternoon. Drapkin captured the floor exercise and scored 38.225 in the all-around, narrowly behind Holmdel’s Kendall Valentin’s 38.275. An emotional Drapkin, who thought she had won the competition for the second straight year, was in tears following the announcement of the scores. After nailing all four of her routines, she thought it was enough to win the all-around. Drapkin won the floor exercise with a score of 9.675, tying Ridgewood’s Yurina Harada for the top spot, and finished fourth on the vault (9.575), fifth on the uneven bars (9.575) and seventh on the balance beam (9.475). Only a sophomore, Drapkin will have two more chances to erase the narrow defeat, and knows that she’ll come back ready to go next season. “I’ll get it next year. I’ll learn from this and being part of a team that’s so good, we were able to win the State Team title, definitely helps and I hope we can come back and do it again next year,” she said. Her Bishop Ahr teammate, Casey Sabino, finished with an all-around mark of 36.175, after finishing fourth on the balance beam (9.550). Old Bridge’s Victoria Lee was the ninth-place finished in the all-around, after scoring 37.075, and Nicole Sottiriou placed 18th for South Plainfield (36.600). Lee was ninth on the vault (9.425) and Sottiriou finished in a three-way tie for eighth on the floor (9.450). Natalie Kowalik of East Brunswick finished eighth on the uneven bars (9.425) and South Brunswick’s Morgan Rybinski was 13th on the floor (9.400). MONTGOMERY — Led by Sarah Pallay and Natalie Onderko, the Hillsborough High School gymnastics team put up impressive numbers at Saturday’s NJSIAA Individual Championships. The duo placed 13th and 16th, respectively, in the all-around competition, scoring 36.950 and 36.625 respectively. Onderko came home in a tie for third on the uneven bars, after a 9.575 mark and Pallay finished in sixth on the balance beam after scoring a 9.525. Emily Shugan, who won last week’s Sectional all-around title, finished 14th in the same competition on Saturday, scoring 36.825, with a fifth-place mark of 9.5000 in the uneven bars leading her day. Teammate Ayana Lee finished eighth on the floor exercise (9.450) to cap a year that saw her compete for Jamaica in the World Championships. South Plainfield’s Nicole Sottiriou finished 18th in the all-around (36.660). ALL-AROUND: 1. Kendall Valentin (Holmdel) 38.275; 2. Julianna Drapkin (Bishop Ahr) 38.225; 3. Kierstin Sokolowski (Lacey) 38.000; 4. Tess Zientek (Holmdel) 37.900; 5. Monica Servidio (Howell) 37.875; 6. Alexandra Wesoly (Lenape) 37.450; 7. Dominiquea Trotter (Middletown North) 37.400; 8. Samantha Marion (Ramapo) 37.100; 9. Victoria Lee (Old Bridge) 37.075; 10. Danielle Doolin (Shawnee) 37.050. VAULT: 1. Kierstin Sokolowski (Lacey) 9.725; 2. Sahara Gipson (Ramapo) 9.650; 3. Dominiquea Trotter (Middletown North) 9.600; 4. Julianna Drapkin (Bishop Ahr) 9.575; 5. Kendall Valentin (Holmdel) 9.550; 6. Danielle Doolin (Shawnee) 9.500; 6. Yurina Harada (Ridgewood) 9.500; 8. Tess Zientek (Holmdel) 9.450; 9. Victoria Lee (Old Bridge) 9.425; 9. Renee Mallick (Montgomery) 9.425; 9. Emily Shugan (Bridgewater-Raritan) 9.425. BARS: 1. Alexandra Wesoly (Lenape) 9.725; 2. Kendall Valentin (Holmdel) 9.675; 3. Kierstin Sokolowski (Lacey) 9.575; 3. Natalie Onderko (Hillsborough) 9.575; 5. Julianna Drapkin (Bishop Ahr) 9.500; 5. Emily Shugan (Bridgewater-Raritan) 9.500; 7. Sahara Gipson (Ramapo) 9.450; 8. Natalie Kowalik (East Brunswick) 9.425; 8. Tess Zientek (Holmdel) 9.425; 10. Monica Servidio (Howell) 9.400. BEAM: 1. Tess Zientek (Holmdel) 9.600; 2. Monica Servidio (Howell) 9.575; 2. Danielle Doolin (Shawnee) 9.575; 4. Casey Sabino (Bishop Ahr) 9.550; 4. Dominiquea Trotter (Middletown North) 9.550; 6. Julianna Drapkin (Bishop Ahr) 9.475; 7. Kendall Valentin (Holmdel) 9.450; 8. Alexandra Wesoly (Lenape) 9.350; 10. Nicole Sottiriou (South Plainfield) 9.325; 10. Kara Giacose (Ramapo) 9.325. FLOOR: 1. Julianna Drapkin (Bishop Ahr) 9.675; 1. Yurina Harada (Ridgewood) 9.675; 3. Kierstin Sokolowski (Lacey) 9.600; 3. Kendall Valentin (Holmdel) 9.600; 5. Sahara Gipson (Rampao) 9.575; 6. Monica Servidio (Howell) 9.500; 7. Jenna Crisalli (Freehold) 9.475; 8. Nicole Sottiriou (South Plainfield) 9.450; 8. Ayana Lee (Bridgewater-Raritan) 9.450; 8. Samantha Marion (Ramapo) 9.450. 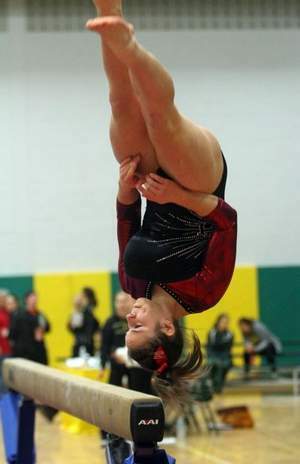 MONTGOMERY — For Holmdel High School senior gymnast Kendall Valentin, her four seasons have been all about progression. As a freshman, the NJSIAA Individual Championships were filled with nerves, as she fell on one of her routines, as she came home seventh. But in the last three seasons, she’s improved to fifth, second and now first in the All-Around competition, as Valentin won Saturday’s title with a score of 38.275, narrowly edging Bishop Ahr’s Julianna Drapkin, the 2012 champion, by 0.050. Valentin didn’t win an individual event Saturday, but placed in the top eight in all four events to emerge as the all-around champion. She finished second on the uneven bars (9.625), tied for third in the floor exercise (9.600), fifth on the vault (9.550) and eighth on the balance beam (9.450). Valentin got a little bit of help on the balance beam, as she got a second chance to do her routine after two of the four judges didn’t look up from their scoresheets to see her compete. Valentin fell during the first try, but the judges offered her a second chance to go and she took advantage. Valentin said that she’ll be continuing her gymnastics career at Eastern Michigan University on a full scholarship next fall. Her Holmdel teammate, Tess Zientek, finished fourth in the all-around (37.900) and won the balance beam (9.600). MONROE — Nursing a one-point lead with just over a minute to play, Myles Hartsfield came up with a game-ending interception, clinching a heart-pounding 35-34 victory for the Sayreville High School football team over Monroe Friday evening at Hugh Walsh Stadium in the Central Group V Tournament’s First Round. The fifth-seeded Bombers advance to the semifinals against top-seeded Manalapan, a last-second, 14-13 winner over Brick Memorial Friday night. Hartsfield picked off Monroe quarterback Kyle Volkmann at the Sayreville 40-yard line and returned the ball deep into Falcons territory to effectively end it. The Bombers were in complete control of the game, up 28-19 at the end of the third quarter, but Monroe simply wouldn’t go away. The fourth-seeded Falcons turned up the pressure, pulling out all of the stops in the process to take a six-point lead. On their first possession of the fourth quarter, Monroe worked the ball to the Sayreville 5 on fourth down and lined up for a field goal that would have cut the lead to single digits. But instead of kicking it, Volkmann who was serving as the holder, spun around and found Cameron Coleman in the corner of the end zone for a 12-yard score. After the point after attempt was good and the Falcons were down just two, they decided to try another trick play. Ryan Schreiber bounced a perfect onsides kick that the Falcons would recover at the Bombers’ 41 and three plays later, Akeer Franklin rolled in from 3 yards out to miraculously put Monroe on top. Volkmann tossed a two-point conversion to David Betancur to make the score 34-28. But the Bombers showed their mettle, going 50 yards on just four plays in less than two minutes to re-take the lead for good. Deion Miller, who had been bottled up all night long, scored his second touchdown of the game, this time from 11 yards out, and Adrian Lapinski added the PAT to make the score 35-34. Monroe’s last-gasp effort from the 46 came up short, as Hartsfield left his stamp on yet another Sayreville victory. Hartsfield scored three first half touchdowns, running in from 7, 37 and 32 yards, and finished with 115 yards on the ground for the evening. Miller, whose longest run of the night was just 24 yards, scored twice and totaled 67 all-purpose yards. Franklin was a beast for Monroe, carrying 33 times for 149 yards and two touchdowns. Volkmann rushed 11 times for 63 yards and added three completions for 61 yards. RUSHING: S – Hartsfield 15-115, Miller 10-61, Pressley 4-42; M – Franklin 33-149, Volkmann 11-63. PASSING: S – Pressley 1-1-6; M – Volkmann 3-4-1-61. RECEIVING: S – Miller 1-6; M – Betantcur 2-49, Coleman 1-12. METUCHEN — After getting an early equalizer and earning the majority of the scoring chances in the game’s second half, the Metuchen High School girls soccer team came up one penalty kick short of a sectional title on Thursday. Jesse Egan’s penalty kick goal in the sixth round of the shootout was the difference as third-seeded Shore Regional upended Metuchen 2-1 (4-3 in shootout) to capture the NJSIAA Central Group I title. The teams’ played scoreless through two 10-minute overtime periods and the allotted five-player shootout round but couldn’t be separated. In the sudden death round of the shootout, Egan calmly stepped up and beat Metuchen goalkeeper Emily Buchanan to the right side of the net and Shore goalkeeper Katie Colaguori stoned Emily Corson to give the Blue Devils their second straight Central Group I crown. “I just stayed confident and I knew my skills and I was just calm and I knocked it through,” Egan said. Colaguori made three consecutive saves in the shootout after Metuchen had scored on their first three shots. Devon Philbin had a chance to win it for the top-seeded Bulldogs but her shot was turned aside by Colaguori. The game certainly didn’t look like it was going to reach a shootout, as Metuchen ramped up the pressure in the first of two overtime periods. Corson had the best of the chances when she made a full-field run after Emily Costello headed out a corner kick, but Colaguori came out of the net to thwart the chance. In the second of the two overtimes, Gabby Cyran nearly ended it, but her shot clanged off the crossbar and Shore was able to clear the box. Corson got Metuchen on the board and knotted the score in the 16th minute after playing give-and-go with Taylor Hueston down the right wing. Hueston played a perfect through-ball onto Corson’s feet and the senior didn’t miss it, knocking in her 24th goal of the season. 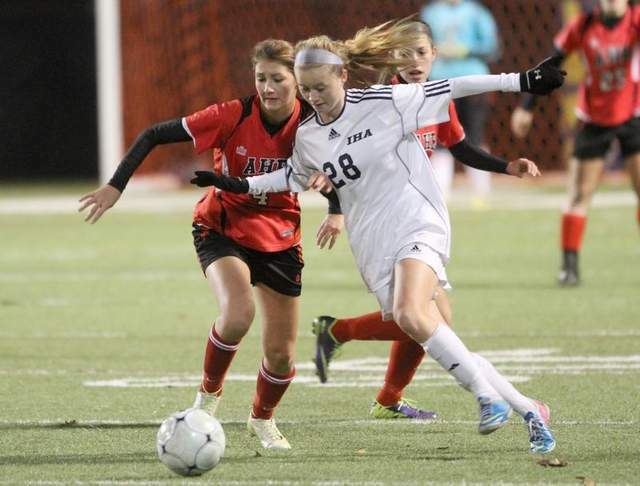 Shore had scored first 12 minutes earlier when Samantha McDonough beat Buchanan to the far post. From there on, the two teams played to a stalemate, neither earning a quality look at the net until overtime began. 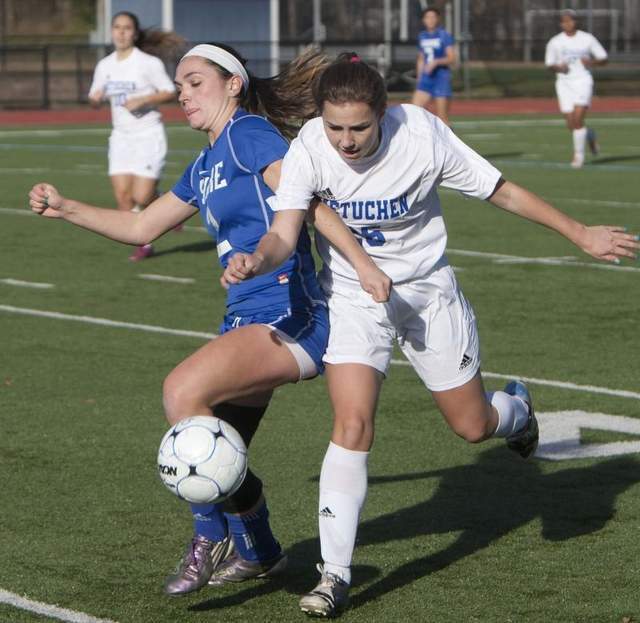 But the field began to tilt in Metuchen’s favor once overtime began, even though the Bulldogs (20-2-1) couldn’t cash in. In the shootout’s first three rounds, Megan Haugh, Alexa Craft-Zaletel and Costello all beat Colaguori, while Buchanan kept Shannon Bonner’s shot out of the net. Colaguori was Shore’s fifth shooter, but she missed the net, forcing the game into sudden death. “Before the game I told the girls that win or lose, they should walk off the field with their heads held high and that’s the hardest thing. We put our best foot forward and that’s all you can I ask for,” Gazda said.